Central Park simply wouldn’t be the beautiful, green oasis it is today without its Unsung Heroes — the Triumphant Trash and Resilient Recycling Cans! Our dependable trash and recycling receptacles are an important part of making sure Central Park is clean year-round. We are looking for 336 Park-lovers to say ‘thank you’ to the receivers of rubbish…the saviors of sanitation…the defenders against debris… Make a donation today to honor our unsung heroes and support the Conservancy’s work to keep Central Park pristine for our millions of visitors. Plus, for a limited time, your donation will be MATCHED to have twice the impact, thanks to a matching gift from a generous donor who also loves a clean and gorgeous Park. 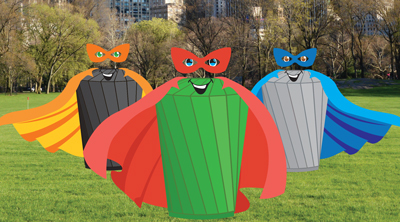 Our trash and recycling cans do their part for Central Park. Won’t you support them?